Excitement here! 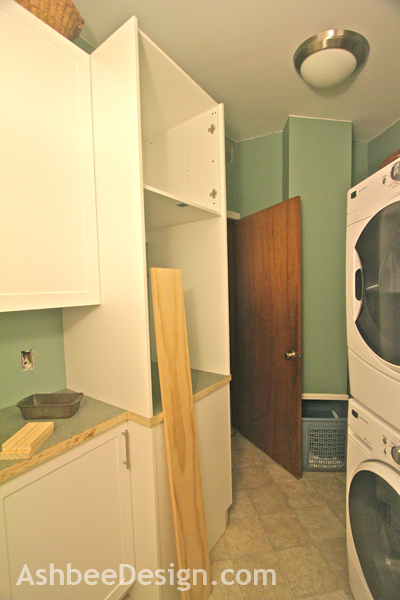 The electrician is coming TOMORROW for finish electrical work in my renovated Laundry room. I am very excited. Thought I bring you up to date on the jobs we have been doing while waiting for the electrcian. 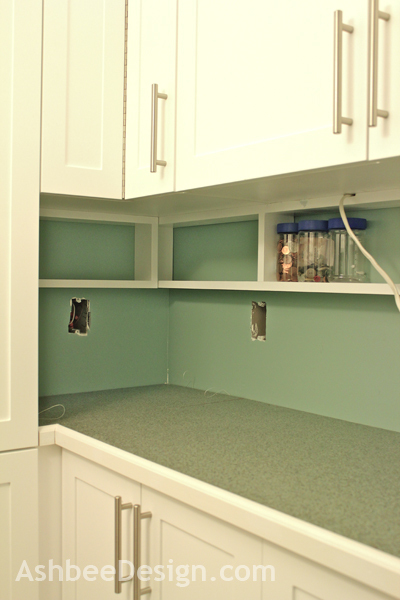 I explained how our contractor took a hike and how we finished the counter tops ourselves in this previous post. My son-in-law and husband collaborated to get the last high cabinet and side panels in. This required a little more muscle than I have. I apologize for the poor photos. This room is so tiny and the lighting is currently a pole lamp in the center of the floor. There are no windows. And the volunteer labor is not willing to wait while I fuss with a camera. 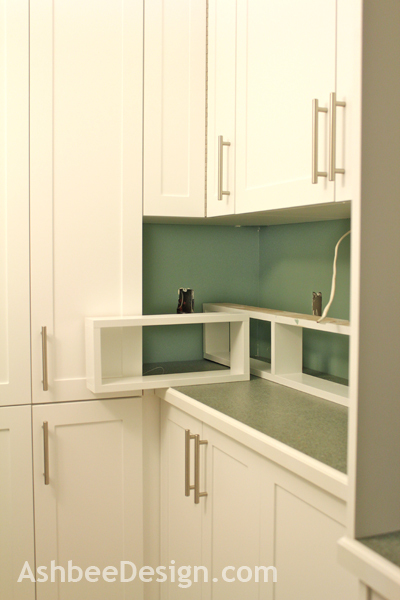 This final cabinet unit will have a storage cabinet above and a small refrigerator in the alcove. Next up is trimming the counter tops. I had been planning on wood trim but I had also been planning on the missing contractor to do it. 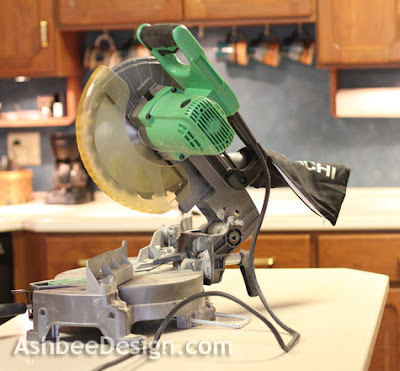 Instead my husband bought me a miter saw. Very cool! I set it up on my kitchen island and I cut trim. This type of saw sure makes this job a whole lot easier. Not perfect but a whole lot better than any other 45º cut I've made! I also built two small shelf units to hug up under the cabinets. I find this space perfect for small stuff and have similar shelves in my kitchen. 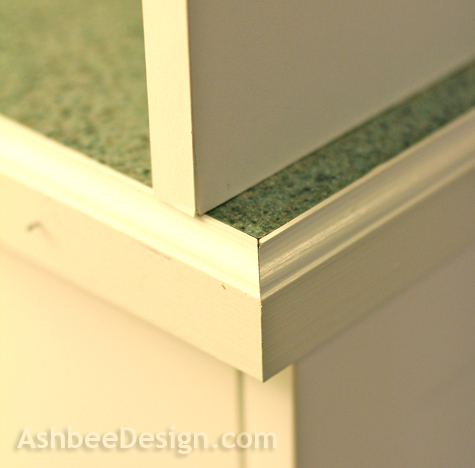 I built these from clear pine (using my new miter saw:-)) and painted them before installing them. 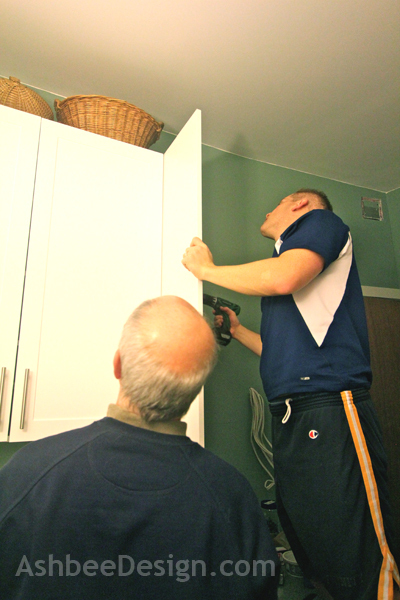 This afternoon David volunteered to help me (read that - let me help him) install the new shelves. Now they are tucked up underneath just waiting for finish electrical work tomorrow- like under cabinet light. We will be done for Thanksgiving! It's all coming together.....looking good.